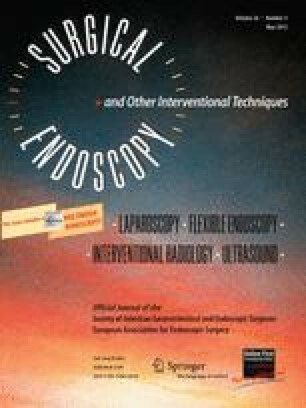 Minimally invasive techniques have become an integral part of general surgery, with recent investigation into single-incision laparoscopic cholecystectomy (SILC). This study presents a prospective, randomized, multicenter, single-blind trial of SILC compared with four-port cholecystectomy (4PLC) with the goal of assessing safety, feasibility, and factors predicting outcomes. Patients with biliary colic and documented gallstones or polyps or with biliary dyskinesia were randomized to SILC or 4PLC. Data measures included operative details, adverse events, and conversion to 4PLC or laparotomy. Pain, cosmesis, and quality-of-life scores were documented. Patients were followed for 12 months. Two hundred patients were randomized to SILC (n = 117) or 4PLC (n = 80) (3 patients chose not to participate after randomization). Patients were similar except for body mass index (BMI), which was lower in the SILC patients (28.9 vs. 31.0, p = 0.011). One SILC patient required conversion to 4PLC. Operative time was longer for SILC (57 vs. 45 min, p < 0.0001), but outcomes, including total adverse events, were similar (34% vs. 38%, p = 0.55). Cosmesis scores favored SILC (p < 0.002), but pain scores were lower for 4PLC (1 point difference in 10-point scale, p < 0.028) despite equal analgesia use. Wound complications were greater after SILC (10% vs. 3%, p = 0.047), but hernia recurrence was equivalent for both procedures (1.3% vs. 3.4%, p = 0.65). Univariate analysis showed female gender, SILC, and younger age to be predictors for increased pain scores, while SILC was associated with improved cosmesis scores. In this multicenter randomized controlled trial of SILC versus 4PLC, SILC appears to be safe with a similar biliary complication profile. Pain scores and wound complication rates are higher for SILC; however, cosmesis scores favored SILC. For patients preferring a better cosmetic outcome and willing to accept possible increased postoperative pain, SILC offers a safe alternative to the standard 4PLC. Further follow-up is needed to detail the long-term risk of wound morbidities, including hernia recurrence. Presented as a plenary talk at the Society of American Gastrointestinal and Endoscopic Surgeons (SAGES) 2011 Meeting, San Antonio, TX, March 30–April 2, 2011. This study was sponsored by Covidien (Mansfield, MA). Dr. Phillips is a consultant for W. L. Gore & Associates and Cook Biotech. Dr. Marks is a consultant/researcher for Covidien, Olympus, and W. L. Gore & Associates and is on the advisory board for Apollo Endosurgery. Dr. Tacchino is teacher/consultant for Covidien. Dr. DeNoto is a speaker for Olympus and a consultant/speaker for LifeCell, Covidien, and Intuitive. Dr. Rivas works as an educator for Covidien. Dr. Soper is on the advisory board for Transeneterix, Terumo, Endogastric Solutions, and Miret Surgical Inc. and has received educational support from Covidien and Ethicon Endo-Surgery and research support from Karl Storz Endoscopy. Dr. Gecelter is a consultant on the advisory board for Covidien. Drs. Roberts, Onders, Islam, Rubach, Paraskeva, and Shah have no conflicts of interest or financial ties to disclose.